- Resistant to scratches and UV from long term exposure to strong sunlight. - Matching frame, legs and header. Please note: Laminate finish will be supplied until stocks deplete. 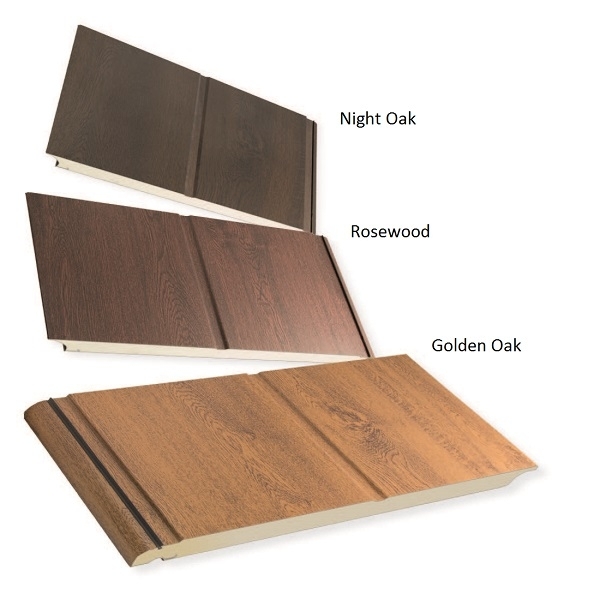 For matching doors, to guarantee the same finish in both doors please notify our sales team. The Carteck Side Hinged doors are built with 40mm thick interlocking panels that insulate and reduce sound transmission. The Side Hinged doors are avaialble in either 50/50 split or Asymmetric split opening. 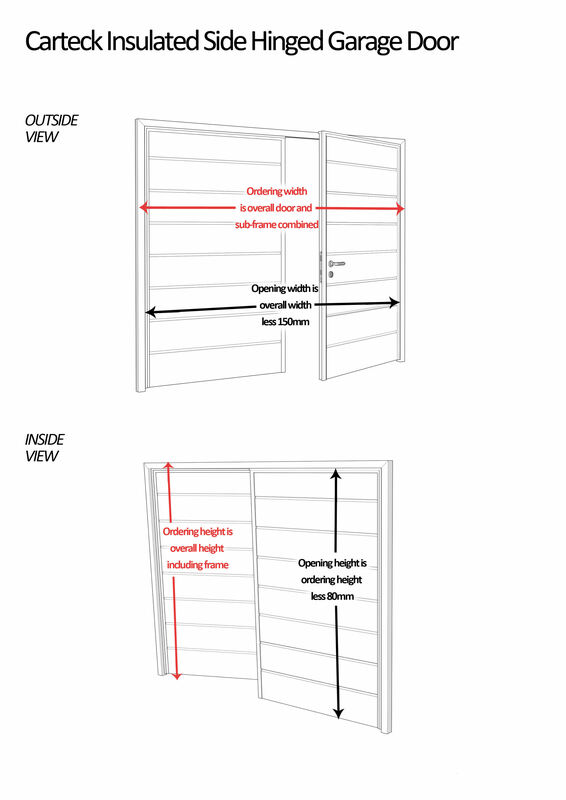 Ordering: The ordering dimensions refer to the OVERALL width and height of the door and sub fixing frame combined and the door is delivered with the frame factory fitted. Please allow for any tolerances you require in the ordering dimensions and the doors will be manufactured to the exact dimensions specified. Carteck door leaves are fabricated using 40mm thick insulated panels with an extruded aluminium perimeter frame and integral seals. An EPDM black threshold seal is provided at the base. Each leaf is fitted with two or three (dependant on size) Dorma LM surface fixed hinges. The door frame is a three side 53mm deep extruded aluminium profile with mitred corners and integral seals. An aluminium ramped low profile cill is also included. Carteck side hinged drive through clearances. Over frame less 75mm per side. Height less 53mm for head. When ordering the measurements are based on maximum overall frame size. DIN standard CE marked European sash lock and a pair of stainless steel round bar lever handles on 50mm diameter roses. A Euro profile cylinder and thumb turn with stainless steel escuthcheons is included as standard (double cylinder, key both sides is available as an option if required). The inactive leaf is fitted with top and bottom recessed lever action flush bolts. A stay is fitted to each leaf to hold the door in the open position. The doors are supplied grey white embossed woodgrain on the inside (RAL 9002). The inside face of the door panels are very easy to keep clean and have no unsightly bracing bars and locking mechanisms. 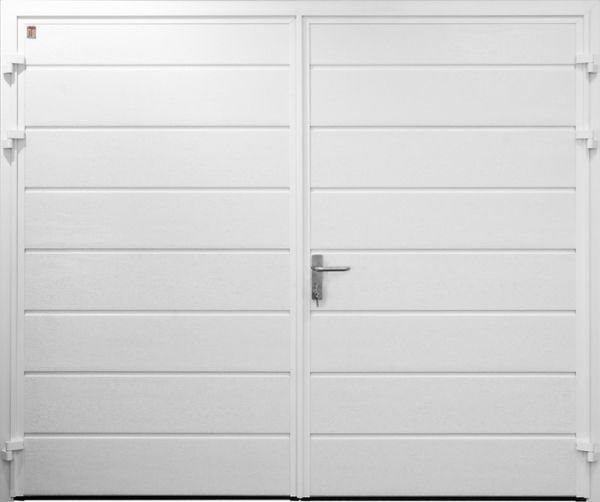 All Carteck side hinged doors are factory fitted with a fully finished aluminium fixing sub frame to make installation easy and precise with tight tolerances where the door hinges and closes. > High Quality Hinges - Aluminium hinges with secured hinge bolts to make it extremely difficult to lever open the door and are easily adjusted. 2 or 3 hinges are fitted to each leaf dependant on size. > Stainless Steel Handles - High grade stainless steel handles and lock covers are tough and attractive. > Double seals and mitred corners - In addition to the circumferential seal around the door leaf the door frame has a three sided seal for excellent draught reduction. Profiles are mitre jointed for a neat finish. > Door stays - Protecting your door from slam closure on windy days these top grade, spring dampened stays hold the door securley in the open position. > Flush bolt security - The inactive leaf is secured with flush bolts to the top and bottom of the leaf.